In 1665, Rembrandt painted an honest portrait of his younger colleague Gerard de Lairesse, unknowingly immortalizing this painter’s unique physical appearance for contemporary speculation. Like Rembrandt, de Lairesse was a celebrated Dutch artist who was widely influential in his time for his French-style paintings. Today, many believe that he shows facial manifestations of this infectious disease. Do you know what disease he may have had? What disease does this man have? Gerard de Lairesse has uncharacteristically boyish looks for a 25-year-old man, with his large forehead and small bulbous nose. Based on the facial features depicted in this painting, he is widely speculated to have suffer from congenital syphilis. 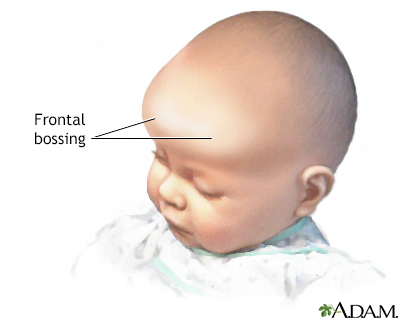 The late manifestations of this disease include the following facial deformities: 1) frontal bossing, 2) saddle nose, 3) short maxilla, 4) protuberant mandible1. In the painting above, de Lairesse presents with all of these features. Unfortunately, de Lairesse completely lost his sight at 49 years old and was forced to give up his painting career for art theory. His blindness is speculated to due to late ocular complications from syphilis, potentially interstitial keratitis.1 However, for de Lairesse to have been as intelligent and successful as he was, his central nervous system must have been spared from his syphilis infection. What is this disease and what are risk factors? What are the clinical stages of syphilis? Syphilis is notoriously difficult to diagnose because its clinical manifestations vary drastically depending on the stage, from completely asymptomatic to a variety of potential complications involving different organ systems. Cardiovascular – aortitis is the most common diagnosis and presents with anginal-like pain or heart failure. It may result in an ascending aortic aneurysm and aortic valve regurgitation, although dissection is very rare. Gummatous – granulomatous lesions of the skin, bone and organs. Neurosyphilis presents in a variety of ways. It is most commonly asymptomatic, but may present as general paresis or tabes dorsalis in late stages. General paresis – personality change, dementia, psychosis. If neurosyphilis is suspected, a lumbar puncture should be performed to obtain CSF for VDRL or RPR testing. In addition, an elevated CSF lymphocyte count is suggestive of neurosyphilis. Johnson H. Gerard de Lairesse: genius among the treponemes. J R Soc Med. 2004;97(6):301-303. https://www.ncbi.nlm.nih.gov/pmc/articles/PMC1079501/. Syphilis – CDC Fact Sheet. United States Centers for Disease Control and Prevention. https://www.cdc.gov/std/syphilis/stdfact-syphilis.htm. Published 2017. Accessed January 27, 2018. Dobson S. Congenital syphilis: Clinical features and diagnosis. UpToDate. https://www.uptodate.com/contents/congenital-syphilis-clinical-features-and-diagnosis. Published January 4, 2017. Accessed January 27, 2018. Sexually transmitted disease surveillance. United States Centers for Disease Control and Prevention. https://www.cdc.gov/std/stats16/Syphilis.htm. Published 2016. Accessed January 27, 2018. Barakat R. Syphilis in the ED: Presentations, Diagnosis, and Management of the Great Imitator – emDOCs.net – Emergency Medicine Education. emDOCs.net. http://www.emdocs.net/syphilis-ed-presentations-diagnosis-management-great-imitator/. Published August 10, 2017. Accessed January 27, 2018. Hicks C, Clement M. Syphilis: Epidemiology, pathophysiology, and clinical manifestations in HIV-uninfected patients. UpToDate. https://www.uptodate.com/contents/syphilis-epidemiology-pathophysiology-and-clinical-manifestations-in-hiv-uninfected-patients. Published October 28, 2017. Accessed January 27, 2018. Hicks C, Clement M. Syphilis: Treatment and monitoring. UpToDate. https://www.uptodate.com/contents/syphilis-treatment-and-monitoring. Published August 15, 2017. Accessed January 27, 2018.